Into a mixing bowl add cashew nut pieces, almond pieces, sultanas, walnut pieces, currants, raisins, fig pieces, apricot pieces, date pieces, candied pineapple pieces, candied gooseberry pieces, candied lemon peels, mango jelly pieces, candied orange peels, candied plum pieces and brandy. Mix all the ingredients well and see that all nuts and fruits are coated with brandy. Cover the bowl and keep it aside overnight. For handy use soak the nuts and fruits in a jar, cover and shake it to coat the nuts and fruits with brandy evenly. Observe that the fruits absorb the brandy in ten minutes. For those who do not wish to use brandy, replace it with orange juice. Next day preheat oven (Conventional oven suits better as cake takes longer time to get baked---here I have used an OTG) at 150OC. Take an oven proof cake bowl and add ghee into it. Coat the ghee by smearing at the bottom and sides of the bowl. Take butter paper in three layers and place at the bottom of the bowl. Similarly line the sides of the bowl also with layered butter paper. Coat the butter paper with ghee and keep this bowl aside. To hot water add instant coffee powder and cocoa powder and mix well. Using a mortar and pestle crush the mixed spices to a powder. Measure 1/8tsp of this powder and keep it aside till use. Into a mixing bowl add unsalted butter and candied syrup. Mix well till the mixture is smooth and creamy. Then add sweetened condensed milk and mix till smooth. Now add the coffee-cocoa mixture and mix well. Add the measured spice powder and flour mixture to the prepared butter mixture and mix well. See that there are no lumps and the batter is smooth. Now add the soaked nuts and fruits and mix well. See that all the nuts and fruits are evenly coated with the cake batter. Transfer the mixture to the prepared cake bowl and level it with a flat spatula. Place this bowl in preheated oven and bake the cake at 150OC for one hour. After one hour, place another rack above the cake rack in oven and cover it with a plate or aluminium foil—so that the top portion of the cake gets less heat and it would not burn. After covering bake the cake for another 30 minutes at 150OC. To test the cake, insert a toothpick and check. If the toothpick comes out clean, it indicates that the cake is done. If batter sticks to the toothpick, then bake the cake for some more time. When the cake is done, remove the bowl from oven and leave it in the bowl for 5 minutes. After 5 minutes, transfer the cake on to a wire rack. Carefully remove the butter paper from the sides and bottom of the cake. Place the removed butter paper on wire rack and invert the cake on to this butter paper---this way the cake will not get the print of wire rack. Cool the cake completely before transferring it on to a serving plate. Cut into pieces and serve. As cold things take longer time to bake, see that the sweetened condensed milk and unsalted butter are at room temperature. Coffee and cocoa mixture would give a nice caramel colour along with flavour to the cake. 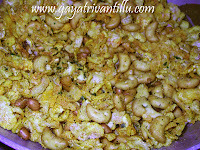 For the flour, butter and condensed milk used in this recipe, in total use 250gms of nuts and candied fruits/dry fruits. As we are using many candied fruits which have their own unique flavour, there is no need to use any essence. 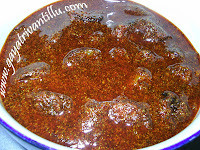 I have used the candied syrup in this recipe. As the candied syrup also has the flavour of the fruit used, I have used it in this cake in place of jam. Any jam of one’s preference may be substituted in place of candied syrup. To soak fruits and nuts I have used brandy. Orange juice may be substituted in place of brandy. The dried fruits soaks up the alcohol or orange juice and is plumped out during baking resulting in a very moist cake. I made this cake using orange juice also. I have observed that the cake made using orange juice is very moist compared to the cake made using brandy. The reason is alcohol evaporates while orange juice got added to the liquid content in the cake. Also the candied fruits got soaked in orange juice becoming soft and got mixed up while baking giving it altogether a new flavour. Whereas when we use brandy the dry fruits like currants and raisins get plump up and all fruits and nuts used in the cake retained their shape even after baking. Hence when we take a bite of this fruit cake, we get different flavours in different bites depending on the fruit we get in that bite. Hence brandy is preferred over orange juice. One can soak these fruits and nuts for up to two weeks also. Mix baking powder well into the flour—if necessary sift baking powder and flour together to get mixed. As the baking is done in a slow process at 150OC (slow baking) and also we are using less quantity of flour, use three layers of butter paper so that it will not get burnt. Use freshly ground spices to get a flavourful cake. A fruit cake is not light as a sponge cake, so it does not need to be beaten as much. Just mix till the batter is smooth. After transferring the cake mixture to the prepared cake bowl smoothen it with a flat spatula making sure that the fruit is hidden by the cake mixture, because it is the fruit that will burn when exposed. Use a serrated knife to cut the cake for best results. As the cake is rich with fruits and nuts it would be easy when we cut it using a serrated knife. One more tip to cut the cake is to freeze it for 30 minutes before cutting to get even pieces. It is advisable to use an OTG (Oven Toaster Grill) or a conventional oven over the convection mode (or a combination mode) of a microwave oven as the baking process is slow and takes longer time to bake. Here I have shown the fruit cake using lesser quantities as we don’t have small children at home and it would be heavy for elders. 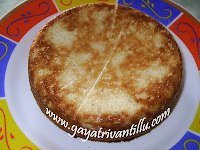 For those who wish to make the cake in a bigger quantity multiply the measurements given and try. Enjoy this rich eggless fruit cake even if it is not a festive season. For Christmas, the cake preparation starts almost 3 months in advance, because various candies are prepared from different fruits which go into this cake.These candies are soaked in Brandy for 3 months and brought out on the eve of Christmas to bake the Fruit Cake. Nowadays we find these candies are available in the market and as a short-cut people soak them overnight in Brandy Everything is FAST-FORWARD, isn't? Enjoy to bake this recipe at home and Enjoy serving it to your family and friends.